It's a gusset that can be added in to your design to reinforce walls that are prone to warping in a specific direction due to the design of your part. 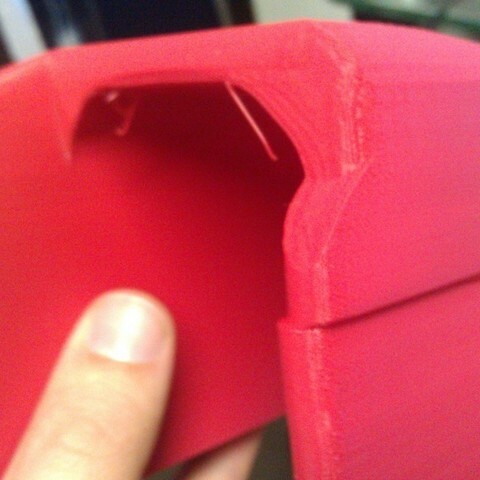 I was dissapointed to wake up to a 14 hr print where a wall had warped in a strange way (the red part). It actually looks like a y-axis shift, but it isn't. The other 2 walls are fine. Upon closer inspection, I observed that the wall was collapsing towards the back of the machine and 'recovered' once it reached a larger mass section giving the appearance of a shift. I fixed this one with a dremel and some ABS glue. When it came time to print its mirror sister in pink, I tried adding in some gussets to support the wall that had collapsed. I used 4 of them evenly spaced. It worked quite well. Sorry about the blurry pic. I didn't check it before I cut the gussets off. This works well when you know exactly where your part is prone to warping. Using your favorite mesh editing program, align the bottom of the part and the bottom of the gusset to the same plane. Scale if necessary. 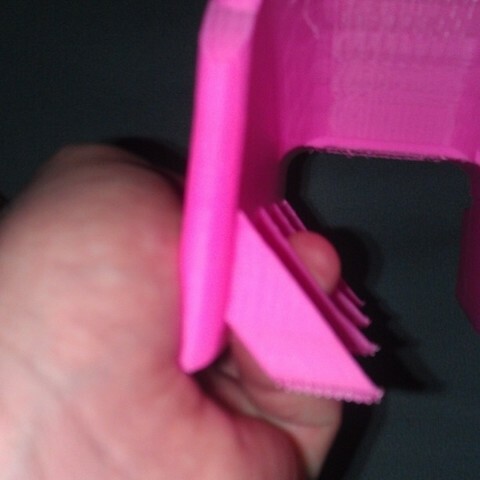 Move/Rotate Gusset so that it is supporting the wall that needs to be reinforced. The chamfered tip can be aligned so that it just barely enters the wall it is supporting. After printing, cut off with some wire snips and sand if needed. If you placed it right, you will not need to patch.